This week for Team-Up Thursday Cara suggested that we use a photo that we took the week before that was our favorite shot or a shot that we didn't realize we had gotten. I loved the idea. The only problem was I didn't pick up my camera last week. However, I did mess around with a different camera. My husband has been wanting to get a waterproof point and shoot for canoeing trips. Plus we are going to the beach in a couple of weeks.....and his birthday was last Friday. Anyways, we bought an Olympus Stylus. Megan's shots inspired me a couple of weeks ago. It's nothing fancy, but it is waterproof so we thought it would do the trick. On Sunday we headed out to go canoeing. On the way to the river I played around with the camera a little bit, but not enough to figure out all the settings. Once on the river we made a stop to play in the water and grab a snack. I tried taking some underwater shots, but the water was too cloudy. Then I placed the camera in the water, but the lens was above the water and snapped a few shots. While previewing the photos on the camera, I was not impressed. I was starting to feel like this purchase was a bad idea. When I got home and loaded the photos on the computer this shot jumped out at me. The photo was clear and the color was perfect. It's not my favorite photo necessarily, but since it pleasantly surprised me I decided to use it this week. It gives me hope that I (or my husband) can get some decent shots with this camera. There are so many things I love about Cara's photo. How it is framed. The little water droplets on Nicolo's face. The wide open mouth with a hint of a smile. Once again, we both have water related shots, which I think is pretty cool. There's more Team-Up Thursday fun over at Mental Inventory. Great idea for a theme. I love coming across the unexpected shot that turns out to be a favorite. what fun! I was inspired by Megan's underwater shots as well, but I haven't gotten the camera yet. I want to...but we'll see. I love that both your shots have water in them. 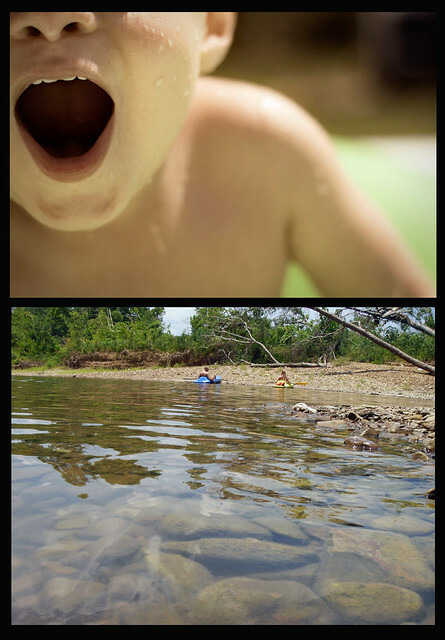 fun diptych! I like the shot. That's neat you can submerge the camera and take such clear pictures from the top of the water. Makes me want one too. :) It's a great combo. love these, jen! it's such a fun pairing. i would have guessed WATER as your theme, too :). let me know how you like the olympus. i am loving it b/c i don't have to think about anything. just put it on sport mode, jam it in a pocket, throw it in a bag, etc. it went with me to scout camp this week, and i even got some decent shots there! Fun week and I look forward to seeing more fabulous water shots from you! That was a cool theme idea! It was open to all sorts of possibilities and in the end these two work really well together. I think I prefer this arrangement with N on the top and the water below. Don't know why. Maybe because it's as if he's coming up out of the water?